Going back to get married there! We were so glad we paid full board as the food was beyond excellent. The staff at the Loutsiana are fantastic make you feel really welcome and feel like you don’t want to go home! The rooms were very clean, location was excellent as you are away from all hustle and bustle in the day and are only a taxi/bus ride away from Aiya Napa. We went for my sister’s wedding and all the family stayed here. We are going back in august 2012 for my wedding! Loved it and definitely recommend it. i went here with my mam and dad an daughter i absolutely loved it i'm only in my 30's so my daughter 17 but location only 3mile out of ayia napa 1.50 euro for 5min bus ride 9 euro for taxi don't pay more than 10 euro for taxi. food is lovely portions are huge try the stifado dish gorgeous. staff friendly entertaining would recommend this to all ages family couples and singles. i love it that much going back 25th oct 09 again and next year! 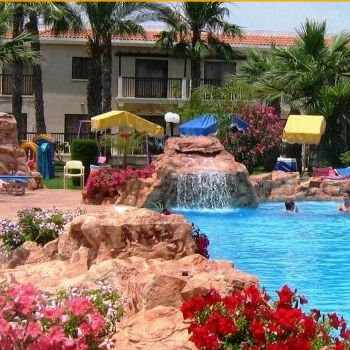 We have had a great holiday staying at Loutsiana apartments. All the staff were great, buy Rachel a drink behind the bar she was brill. The apartments wer basic but spotless, the pool area was good no problem getting a bed no matter what time you dragged yorself out of bed. We had breakfast every morning 4,50 euros for a full breakfast was good value.The bus stopped right outside the apartments 1,50 euros into town and the water park(which was great) was 5 minutes walk away. We was there for a family wedding most of the other family was staying in other hotels but when they came to visit they said they wished they had stopped at the Loutsiana.It had a great atmosphere around the pool because it was a small complex everybody seemed to get on very well together. If that doesn`t get me a free holiday I will eat my pants. Try the Loutsiana you will not be dissapionted. we stayed in 1 bed apartment(106)1st floor overlooking the pool.sun on the balcony till about 2pm (very hot!! )aircon a must in july/aug.it may be pricey for some people, (we budgeted for it before arriving,it was 6 euros per unit per day) but what a relief on an evening. hotel grounds are spotless ,the lawns are cut every week.the bar staff are really friendly and prices could be a lot worse 3euros local brew (2 during 9-11pm),.pool +jacuzzi like a warm bath,lovely and clean penty of loungers if down before 9am (i was down about7.30-8.00 as i had to go to on-sight shop for dailly fresh rolls,doughnuts ,tomatoes etc).the shop stocks most things.we chose this hotel because we had stayed before 13 years ago and we knew it was in quiet location.. I regularly visit Ayia Napa and usually stay in the same area as the Loutsiana are located which is near the Waterpark end of Ayia Napa called Macronissos. Last year we decided to call in here and check them out for 2007, we were happily shown an apartment by Panicos the owner and whilst basis they seemed very clean. So we booked 3 one bedroom apartments for July 2007 at the beginning of this year via email directly with the Loutsiana. On arrival at 3am following a night flight we arrived weary and hot. There was a night porter on who spoke no English and he seemed shocked we were expecting 3 apartments. After 20 mins of trying to sort out I took his room order sheet and lo and behold the "missing" apartment was on the back sheet....relief. But it just got worse from here on in, 3 of our party were given there key to an apartment at the back of the main block (these are rented out to workers) The porter then advised us he had rung a taxi to take the rest of us to Loutsiana 2 ?? We were very confused and he couldn't explain anything to us. Eventually after a further half hour a cab arrived and we duly loaded our cases, the porter spoke briefly to the driver and off we went rather bewildered. Approx 800yds down the road we turned in between a supermarket and a bar into a unlit car park. The driver waited for another 10 mins for the porter to arrive on his moped and in the meantime we were melting in the back of the cab....all 4 of us plus luggage. The taxi driver swore and drove us off again back up to the Loutsiana, we again waited in the car for 10 mins before the porter arrived and began arguing with the driver ! Once again we were off and pulled up outside the unlit car park. The porter gave us 2 sets of apartment keys and pointed to two apartments in a tiny complex at the back of the supermarket which surrounded a tiny swimming pool. Both are one bed apartments were spotlessley clean albeit very basic, although we did have a whistle kettle, but no toaster and only basic cups and glasses etc. We had paid for air con and there was only a unit in the bedrooms, the electric was operated via the room key fob, this couldn't be removed from the key thus you couldn't leave the air con on whilst you were out and the unit was very, very old and couldn't be adjusted temp wise, a pretty inefficient affair but better than nothing. The beds were like rocks and very uncomfortable, but the rooms were spacious and we had a large dressing table and plenty of storage, although the wardrobe's are pretty small. Plenty of plug sockets in all the rooms too. The bathroom was very small but very clean, the shower was useless as was the shower curtain which finished above the bath edge thus we had a swimming pool every night following our showers ! Our 1st floor apt had a huge balcony with a table and 2 chairs and plenty of room to sunbath if required. Any repairs were dealt with very, very quickly. We had a lightbulb out which they were aware of but hadn't been able to repair so they sent an electrician to replace the whole light fitting, our patio door was also broken and again it was repaired within the hour. We did on 2 occasions have Cockroaches in the apartment when we returned in the evening, one in the bathroom and another HUGE flying one in the lounge, very scary and the first Cockroaches I've seen in any Cyprus properties I've stayed over the last 20 years, so I guess I've been lucky up until then. The pool was very small as was the surrounding area, although there was one sunbed per apartment but I suspect if it was full to capacity you'd struggle to cater for everyone. There was also an outside shower which was especially important as the pool was heavily chlorinated. Every other day a young boy would arrive to poor chlorine powder directly into the pool, despite people using it at the time. The smell was overpowering and not once in 2 weeks was the pool cleaned, there was lots of sand (from those inconsiderate enought to come off the beach and bathe in the pool to rid themselves of the sand !! ) But there was a myriad of dead and live insects, leaves, grit throughout the pool. As for the childs tiny section of the pool it looked more like a footbath and it was filthy dirty. There is no pool bar to get a drink or anything to eat which is very disappointing. The maids are all Russian at both the Loutsiana 1 & 2 and speak no English, which makes life a little difficult. They insist on cleaning the apt daily whether you require it or not and there is absolutely no debating the subject with them, they just clean around you regardless. I suspect this is to keep the high standards of cleanliness up which is commendable BUT a lie in would have been nice on occasion, we were on holiday after all ! The live in maid at Loutsiana 2 regularly went complete skinny dipping with her boyfriend at 4 in the morning in the pool we also witnessed more than just swimming taking place...Eugh. Thankfully we're beach lovers so rarely used the pool. All our shopping needs were met by the adjacent large supermarket, which is also owned by the family who own the Loutsiana apartments and small villas next door x 2. The 3 who stayed at the Main Loutsiana had the better of the apartments, whilst they were identical to ours and had no views to speak of except the back of other apartments. These apts surrounding the main pool all seemed to be reserved for Tour Operator customers and not direct bookings, which is unfair when you consider they're most definitly getting more money per apt from direct customers that the peanuts the TO's throw them. But I suspect they ahve to keep them happy. There is a small supermarket on site here but pretty small. There is a bar which does food all day too and this is partly run by an old english woman that works for Panicos, she's very sullen and never cracked a smile once whilst we were there. The pool at the Loutsiana 1 is really nice, kept spotlessley clean and also has a jacuzzi and small waterfall, which just made our stay at L2 seem all the worse. The grounds are immaculate and people are always cleaning, pruning and tidying which is very nice. The staff were friendly enough and we did have a good holiday but none of us would stay here again. My main advice to anyone booking would be to absolutely clarify which apts they intend to put you in. During our fortnight every party that arrived after us at the L2 left within a day or two and were moved to L1, I suspect these were TO customers who complained, they did this from the moment they arrived to all and sundry. We did ask on our first day to move but were told they only had one other apt in the L1 and we wern't prepared to leave 2 of our party to the cheap seats at L2 on their own so we stayed reluctanly put. My partner & I got married in Cyprus & we actually stayed in Adams Beach Hotel but half of our wedding party stayed in the Loutsiana. We spent an awful lot of time there & enjoyed it so much we have already booked for next year. The apartments were basic but had everything you need to be more than comfortable & were cleaned regularly. The food was lovely & very cheap & fabulous service was always given with a smile. The pool was a good size & again it was spotless. The apartments themselves are a little out of the way but they do however have a direct link to a taxi firm so getting about was never a problem. There was no entertainment to speak of just a weekly BBQ.